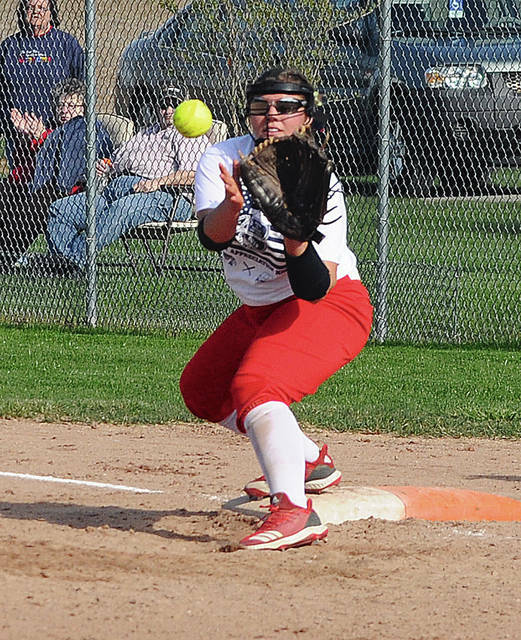 Rob Kiser|Miami Valley Today Piqua batter Kamy Trissell puts the ball in play against Sidney Tuesday. 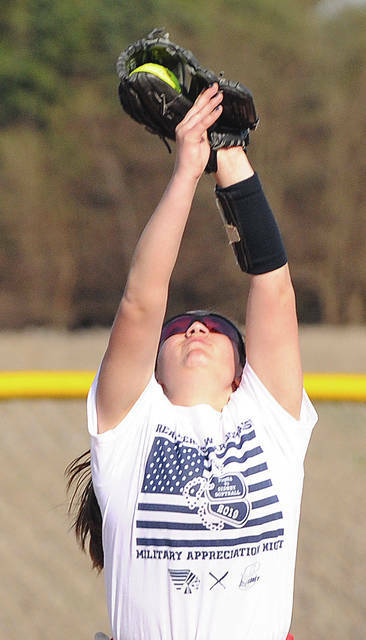 Rob Kiser|Miami Valley Today Piqua first baseman Hannah Anderson makes a putout at first base Tuesday against Sidney. 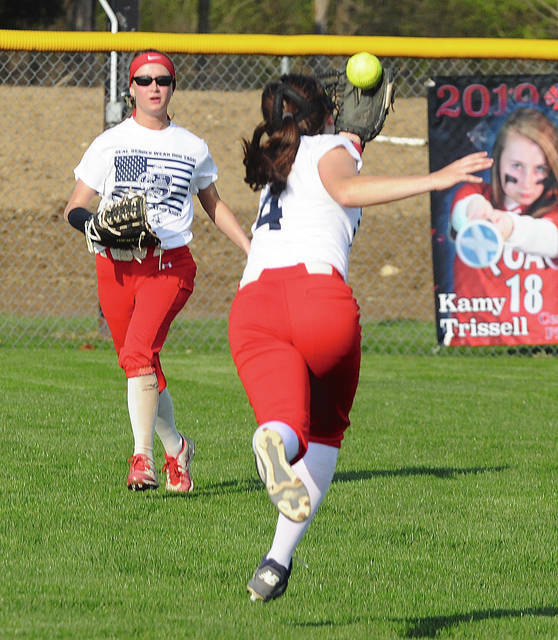 Rob Kiser|Miami Valley Today Piqua shortstop Reagan Toopes makes a running catch against Sidney Tuesday as centerfielder Kamy Trissell backs up the play. PIQUA — It was a dream scenario. And Piqua senior catcher Kylie Trissell didn’t disappoint. 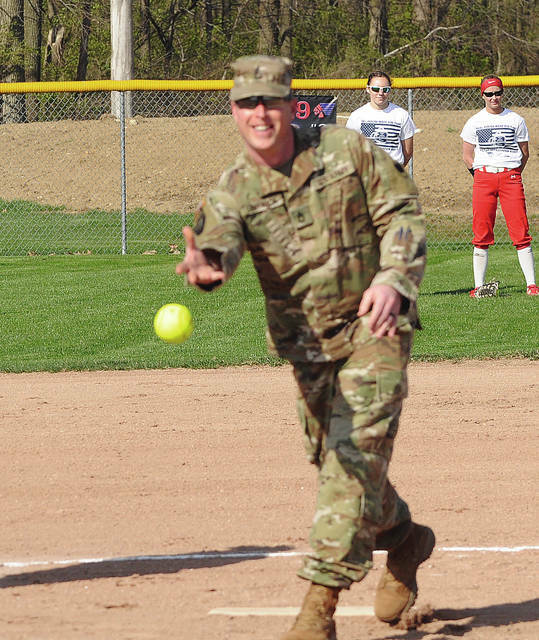 With the bases loaded and no outs in the home eighth inning against Sidney Tuesday on Military Appreciation night with the game tied 4-4, Trissell stepped to the plate. And Trissell had one thought when she stepped to the plate. She lofted a ball towards right field deep enough to easily score Kenzi Anderson from third base. 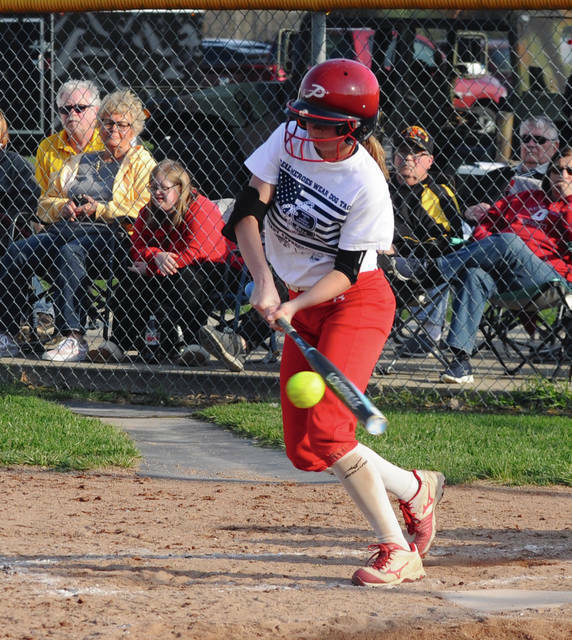 When the ball fell behind the outfielder, it became a walk-off single giving Piqua a 5-4 win in GWOC American play and a sweep of the series with Sidney. Especially after Piqua had led the whole game, before Sidney rallied to tie it in the sixth inning. Piqua improved to 12-4 overall and 5-3 in GWOC American play with the win. Sidney dropped to 6-8 overall and 4-5 in GWOC American play. “It is always big, anytime you can win a game like that,” Trissell said. Sidney had taken a 1-0 lead in the top of the first. Naida Stephens singled and eventually came around to score on Lauren Barker’s RBI single. But, Piqua answered with three runs in the home first. Hannah Anderson and Kamy Trissell singled before Paige Hinkle ripped a two-run double in the gap. Kathy Young’s sacrifice fly would score the third run. In the second, Hannah Anderson hit her second home run off Sidney in as many days, lofting the ball over the fence in right-center field to make it 4-1. Both Hannah and Kenzi Anderson have two home runs each in the season. 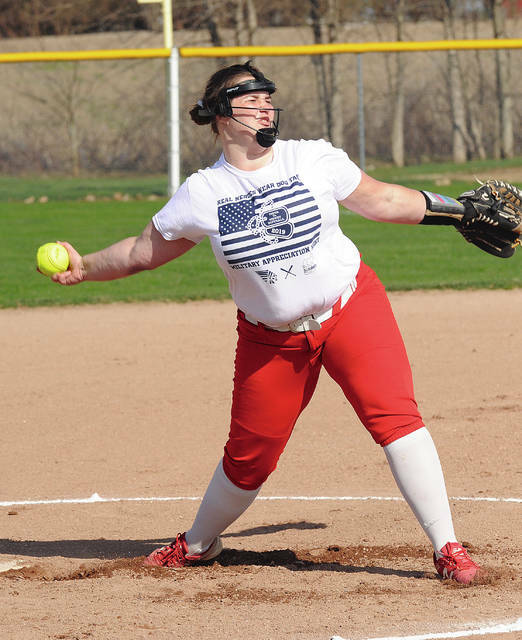 After that, both Piqua pitcher Mariah Blankenship and Sidney pitcher Lauren Barker put zeroes on the scoreboard until the Sidney fifth. Heidi Aselage had a single and Alli Milanese had a double. Jenna Smith’s fielder’s choice scored one run and the second run scored on a Piqua throwing error. Sidney tied it in the sixth. Milanese singled and with two out, Stephens drilled a RBI double to the left field fence. But, Blankenship would not allow a Sidney baserunner the rest of the way. Piqua missed a golden opportunity to score in the home sixth. Kenzi Anderson reached on an error and Young singled. But, Barker retired the next three batters. The eighth started with Kenzi Anderson walking and Young singling. Reagan Toopes reached on an error to load the bases and giving Kylie Trissell the opportunity for the walk-off single to end it. Blankenship pitched a seven-hitter, striking out six and walking one —- finishing the eighth by striking out the final two batters she faced. Barker pitched a 10-hitter for Sidney, striking out four and walking one. But, in the end, Kylie Trissell and the Lady Indians got the dream finish they were looking for. 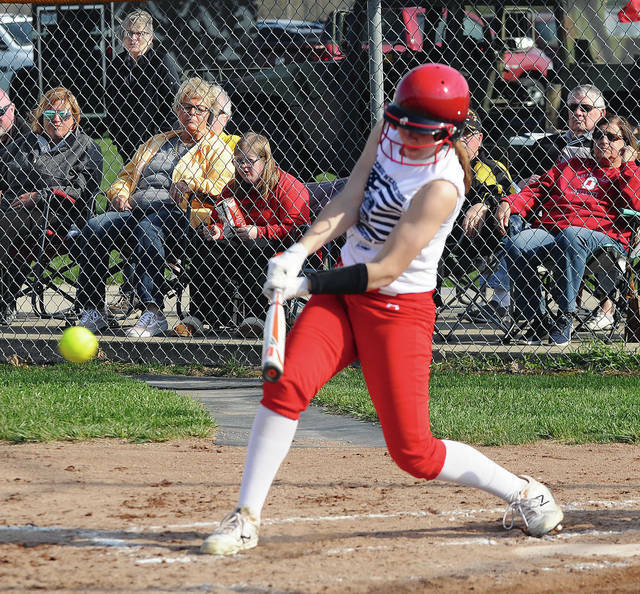 https://www.dailycall.com/wp-content/uploads/sites/30/2019/04/web1_kamytrissell.jpgRob Kiser|Miami Valley Today Piqua batter Kamy Trissell puts the ball in play against Sidney Tuesday. https://www.dailycall.com/wp-content/uploads/sites/30/2019/04/web1_hannah.jpgRob Kiser|Miami Valley Today Piqua first baseman Hannah Anderson makes a putout at first base Tuesday against Sidney. https://www.dailycall.com/wp-content/uploads/sites/30/2019/04/web1_reagan-toopes.jpgRob Kiser|Miami Valley Today Piqua shortstop Reagan Toopes makes a running catch against Sidney Tuesday as centerfielder Kamy Trissell backs up the play.